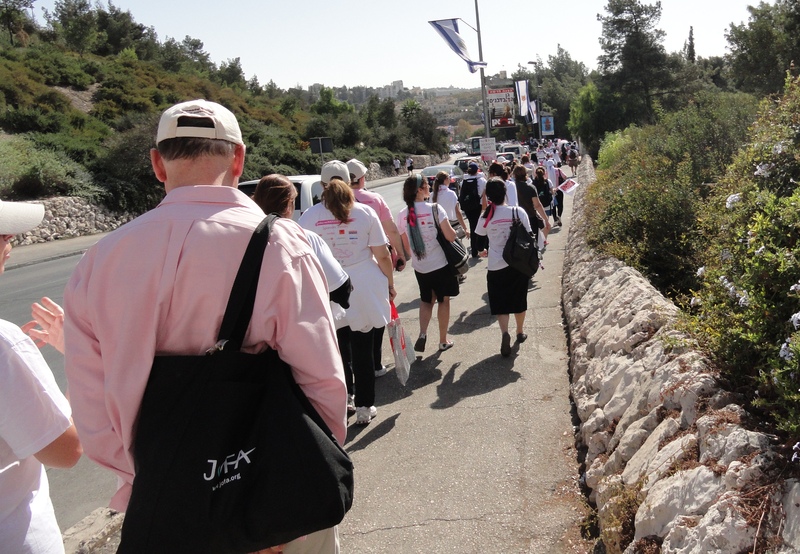 in Israel was held in Jerusalem. 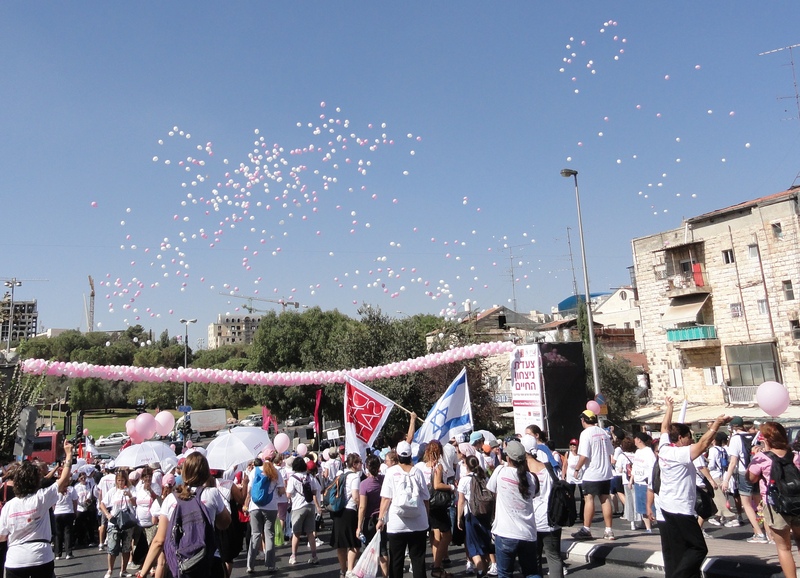 White tents and pink balloons filled Gan Sacher, Sacher Park. with about 200 special pink ones going to breast cancer survivors. In spite of the blazing sun, at least 5,000 people were in the park at noon. Remax was one sponsor and had a special tent, and the only red, white and blue. walking together as a large group under white umbrellas. 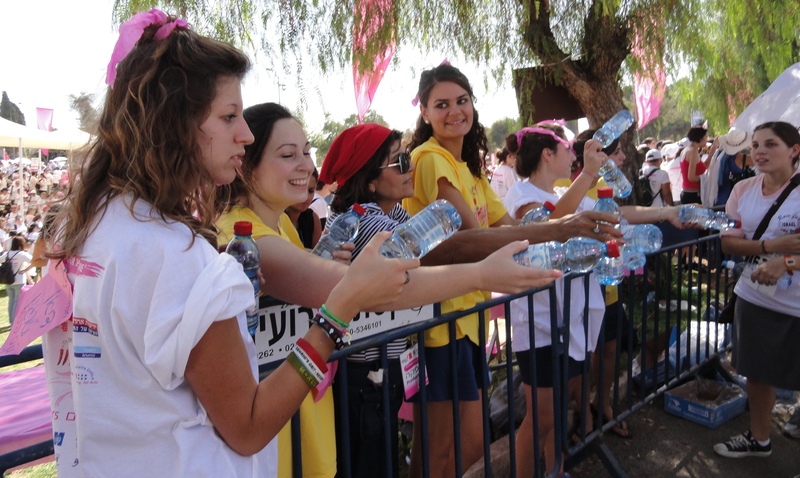 Leaving the park, walkers grabbed bottles of water which were appreciated in the heat. 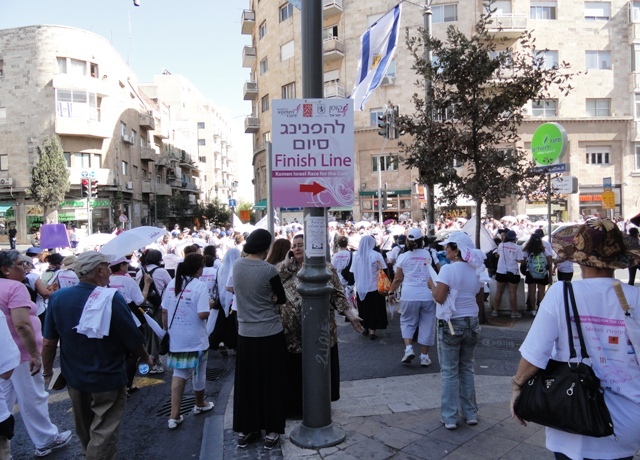 The 3.5 kilometer walk/run began under a pink and white balloons on Bezalel Street. Buses blocked the traffic, and even they looked pink. 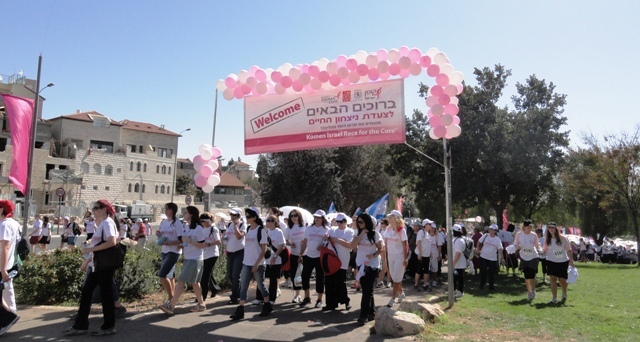 The Hadassah group began walking as pink and white balloons filled the skies. 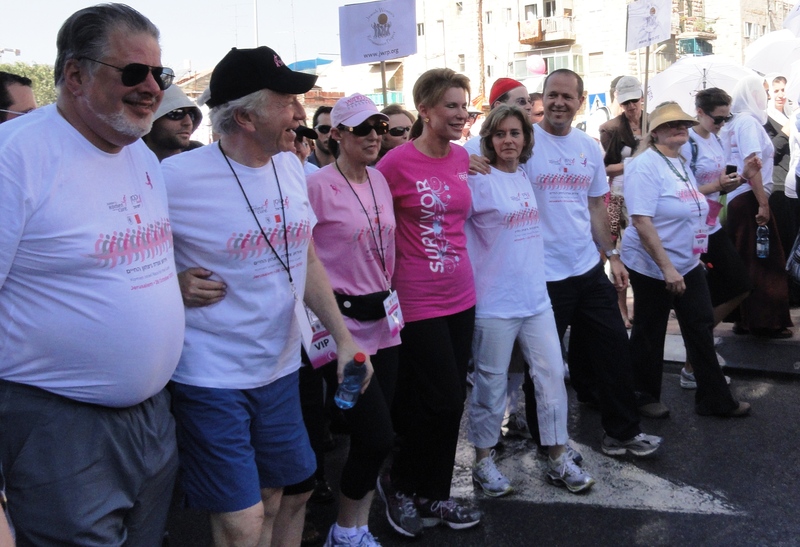 and Jerusalem Mayor Nir Barkat and his wife Beverly led the way. 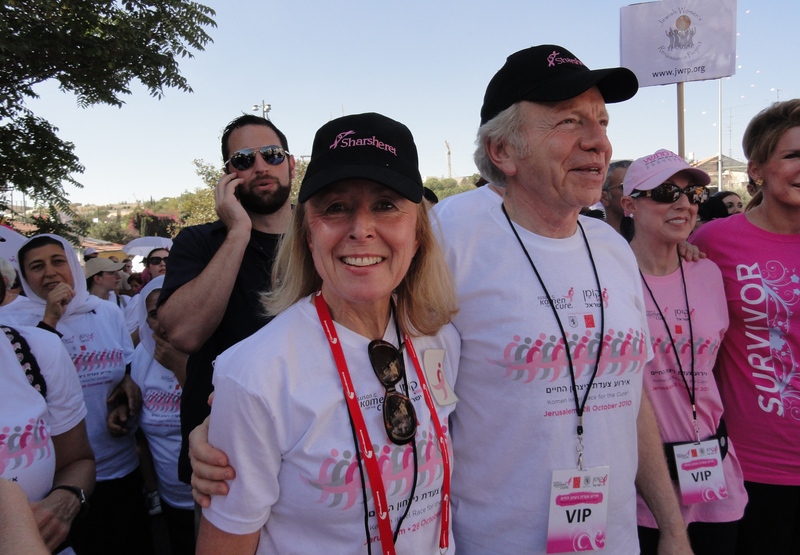 Hadassah Lieberman and Senator Joseph Lieberman seemed to enjoy the day. The march turned at the corner of King George Street, towards the Old City. while the marchers had to walk in the sun on the sidewalk. 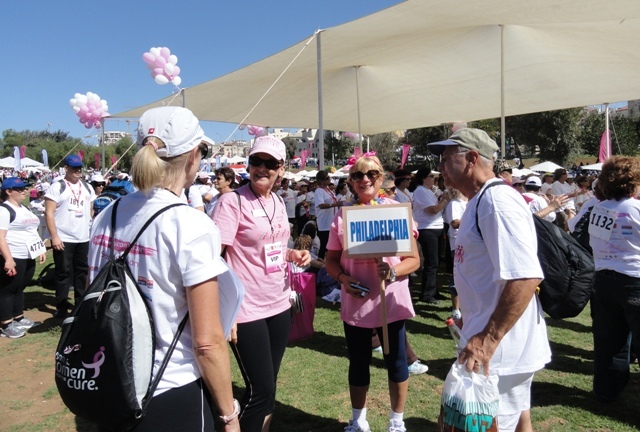 and ended at the finish line which was near the Sultan’s Pool. 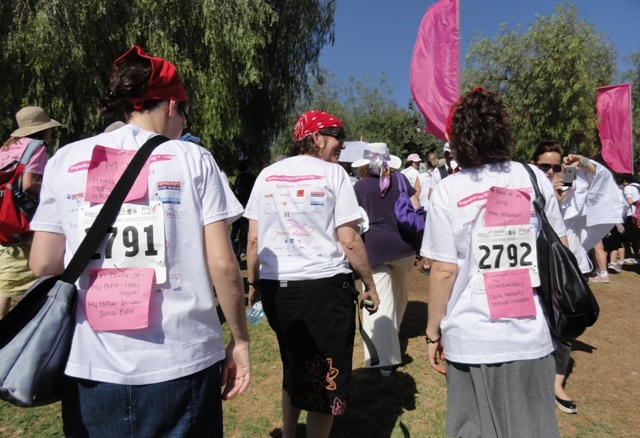 not everyone wore pink and white. 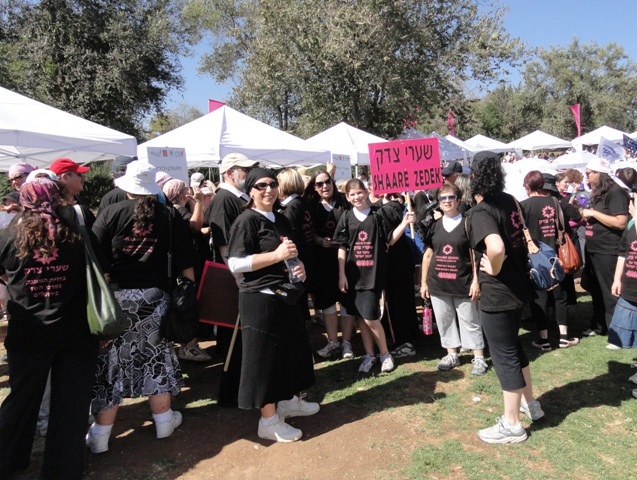 Shaare Zedek Hospital opted for black t-shirts. 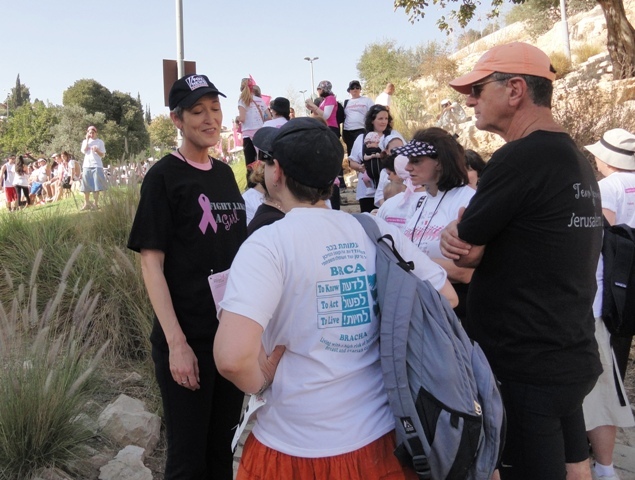 Also, wearing black t-shirts was Jennifer’s Team. came with a whole camera crew to record the event. 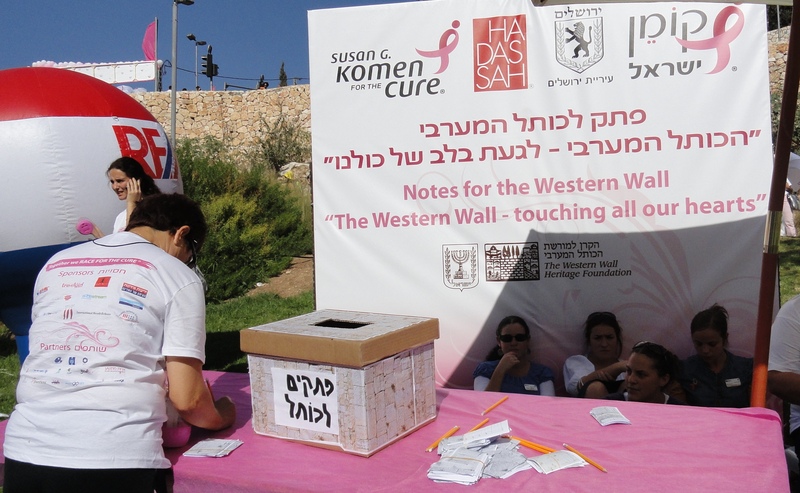 but only in Jerusalem… a box to put notes in the Kotel, the Western Wall. 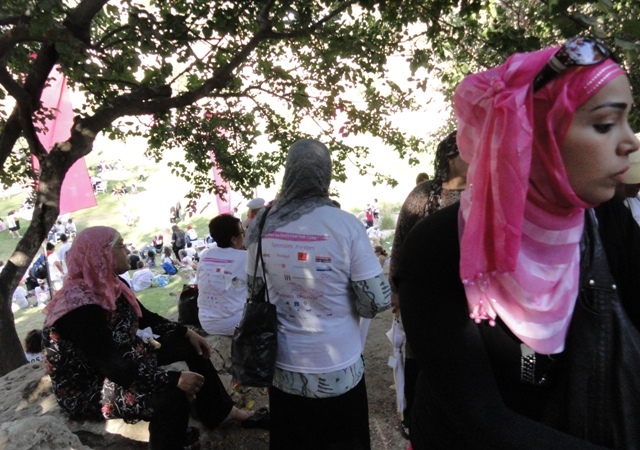 who have breast cancer or who have died from the disease. 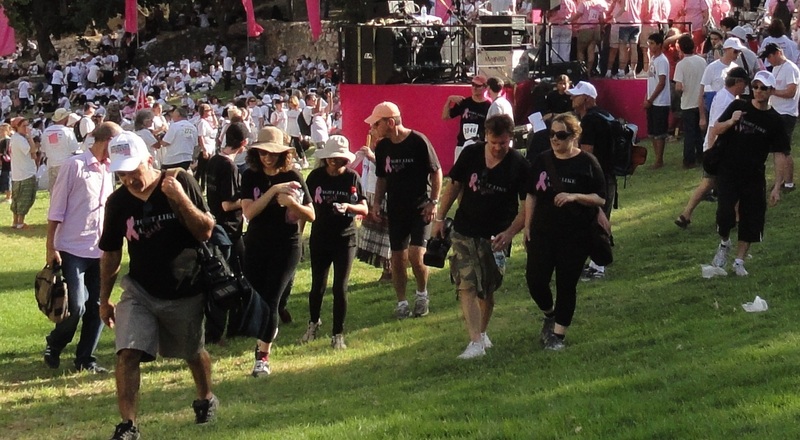 million of dollars were pledged to cancer research to find a cure. 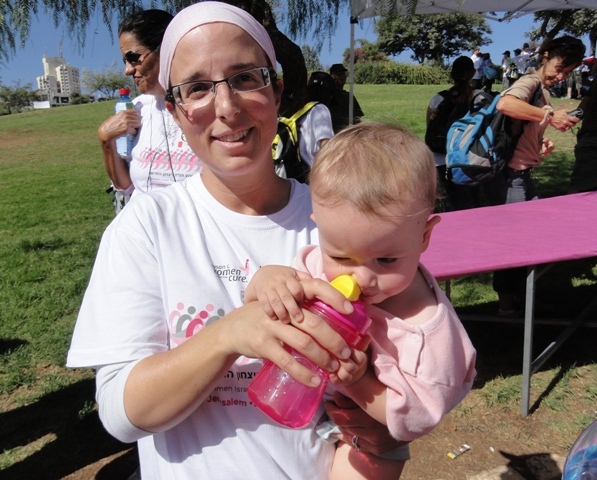 RivkA bat Tirzel z”l ran out of time waiting for that cure. 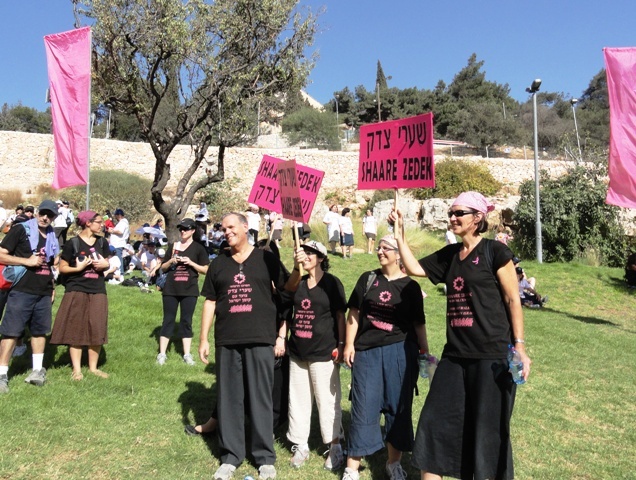 Your photos are great and the message is loud and clear, we need a cure now!!!! 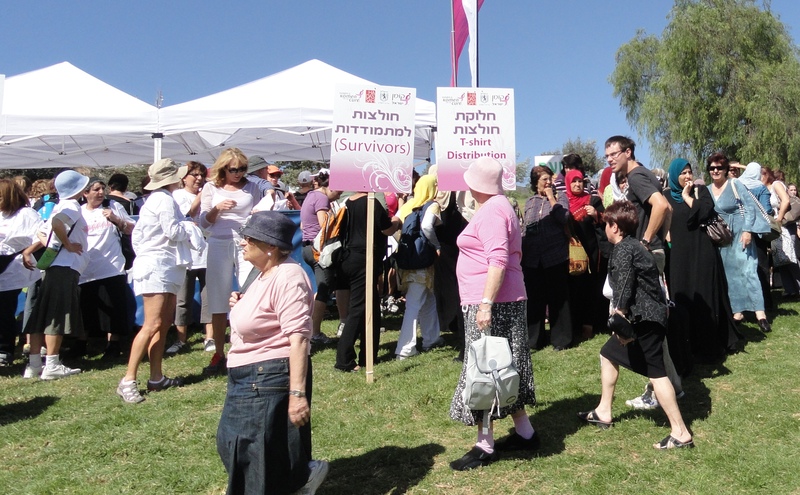 Broke my heart all over again to see this picture of RivkA’s sign. I walked behind the woman carrying that sign for a little while. Beautiful pictures. 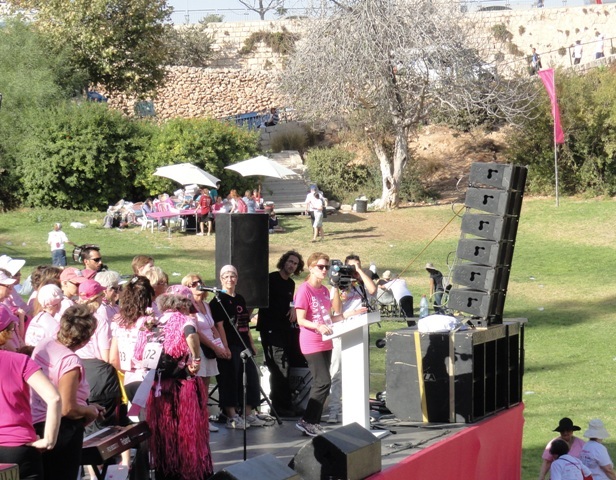 As one of the speakers put it, breast cancer knows no borders, and it was seen in all the obviously Muslim and Jewish women walking side by side. It’s amazing what brings us together. 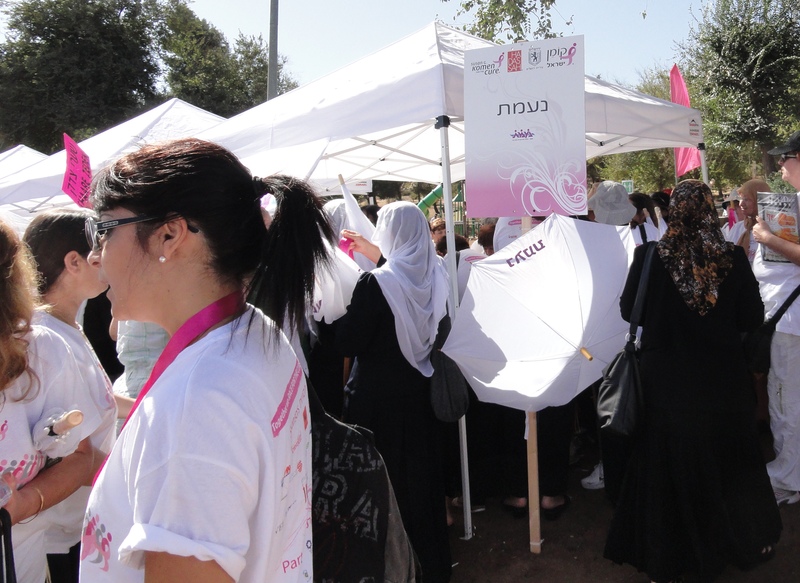 Although, note to Na’amat for next year, if Moshiach doesn’t come and we still need this walk: the umbrellas were dangerous! We were getting poked in the head, and quite a few eyes had plenty of close calls. It was a great idea, in theory. Maybe next time, just the umbrella hats? Thanks again for these photos. I thought the umbrellas were good idea, too much sun on a hot day. The route was hardly in the shade, bad planning. Thank you for showing us the real Jerusalem streets. These photos are wonderful! 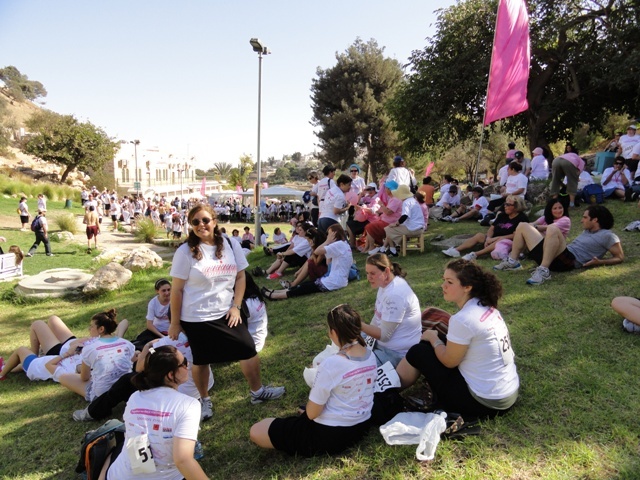 They are reminding me of the wonderful day and people participating in the race. It was great to see the lack of cultural and racial devides – we were all one that day. You are doing us a tremendous service by showing what the real Jerusalem is like. Thank you so much. We appreciate and value what you are doing. Your photo story was amazing! I participated in the 3 day (60 mile) event here in the states. Watching your experience brought back so many fabulour memories of stories shared, people met, and hopes that soared. LET IT BE NOW!! 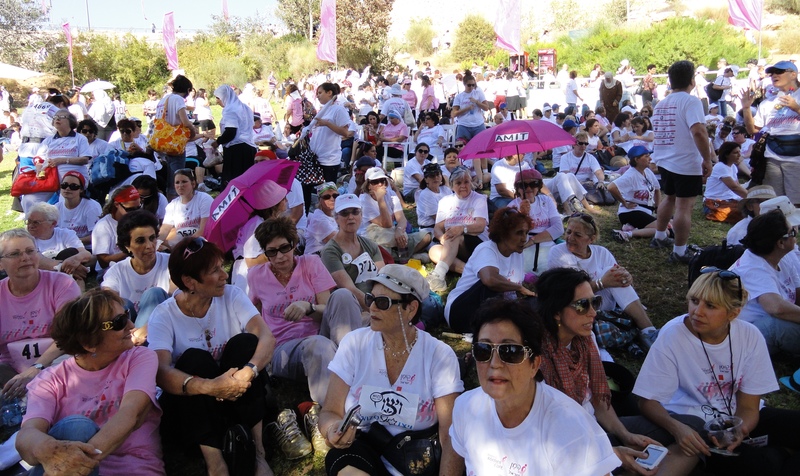 As a survivor of almost 20 years I was so happy to see this event in support of breast cancer awareness in Israel. 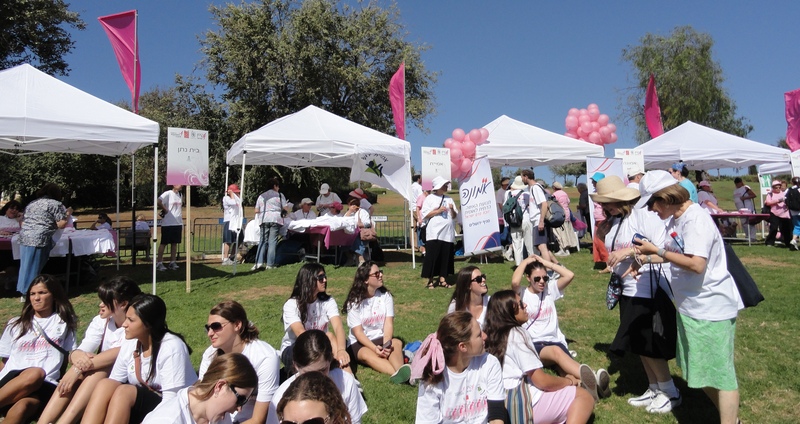 May there be a cure in our lifetime, but until that time, events like this should continue in Israel and all over the world. What a great event and you covered it so well. It was exciting to see so many people from all different walks of life there.